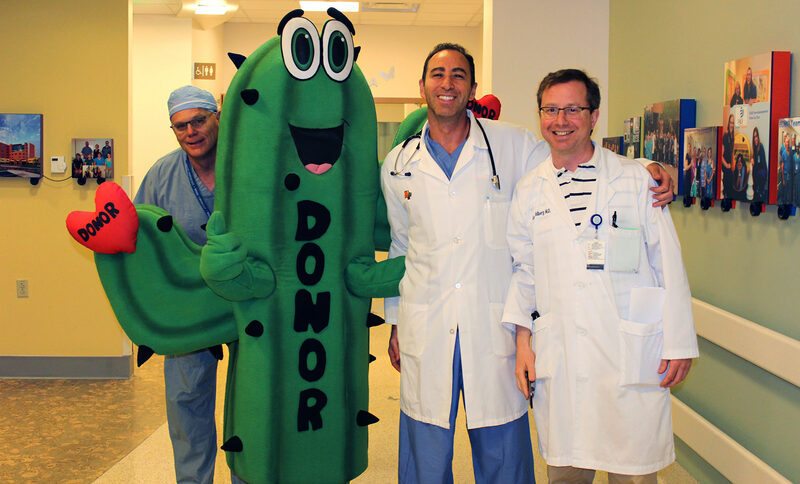 Reggie the Donor Cactus visits with hospital physicians at Cardon Children’s Medical Center during Health Care for Hope. Donor Network of Arizona is always looking for people to champion our Donate Life message and be a voice for donation and transplantation throughout Arizona. Donor Network of Arizona (DNA) relies on professional partners throughout the state to make the incredible gifts of organ, tissue and cornea donation possible. Our partners work side-by-side with DNA to facilitate a donor’s generous decision to share life, offer compassionate care for donor families and connect donors’ selfless gifts with recipients in need. Donor Network of Arizona partners with hospitals and their staff to increase opportunities for organ, tissue and cornea donation and transplantation. Donor Network of Arizona works with hospice professionals when an individual in their care or the individual's family has requested information on donation. Donor Network of Arizona works with the Arizona Office of Medical Examiners to ensure donation is possible in cases that fall under their jurisdiction. Donor Network of Arizona partners with funeral professionals to ensure the comfort and care for donor families throughout the donation process. The eye bank at Donor Network of Arizona supplies cornea tissue for transplant to accredited eye surgeons in Arizona, and distributes nationally and internationally. Health Care professionals can renew their certified Designated Tissue Requestor status with Donor Network of Arizona for tissue and cornea donation.